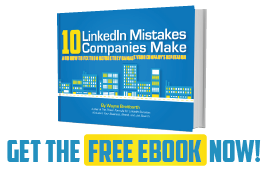 « Are You Ignoring Your LinkedIn Connections? 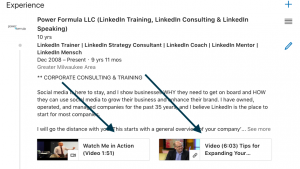 Is the Experience Section of Your LinkedIn Profile Hurting You? 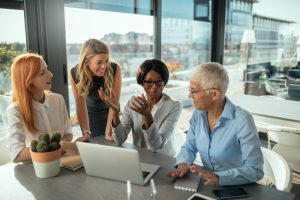 Whether you're a thirty-year business development professional using LinkedIn to help hit your numbers each and every quarter, just graduating from college and hoping LinkedIn will help you find your first great job, or anything in between, the Experience sections of your profile could make or break you. You may be wondering where the heck are the Experience sections on my profile—all I remember seeing is a Jobs section. Well, they are one and the same. This is prime real estate. LinkedIn gives you 2,000 characters for every job you've had. Here's how you can tell your unique branding story, include your most important keywords, and take full advantage of this section. 1. It's more than a list. Describe job duties in a way that will explain and add interest and credibility to your story. Don't simply list what you did. Remember—on LinkedIn you're being compared to other people who do the same thing you do; so the goal here is to impress the reader and stand out from the crowd. Learn more about using media to set yourself apart from your competitors by reading my article Here's How to Give Your LinkedIn Profile that Wow Factor. 2. What are your strengths? Be sure to include accomplishments that show your diverse experience and your ability to get important stuff done. If you can be specific with statistics and/or results, all the better. 3. Did you get promoted? Add a separate Experience entry for all promotions you received at each job. 4. Tie the past to the present. Highlight the traits, characteristics, responsibilities, and results from your past jobs that most closely align with your current situation. Help the reader understand how your past experience makes you a better fit today. 5. Describe the type of customers you serve/served. 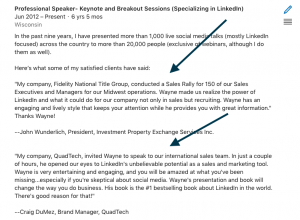 You could even include a killer quote from one of your clients that you extracted from either a LinkedIn recommendation or a letter of recommendation. 6. Include descriptive titles. Take advantage of all the characters available (100 max) in your Experience title. This is fertile keyword soil. For example, one of my job titles, CEO | Social Media Trainer and Strategy Consultant (specializing in LinkedIn), I could have simply said CEO, but this is a much better description of what I do, plus the extra keywords (social media, strategy, consultant, LinkedIn) will help people find me. 7. Keywords are key. Keywords, keywords, keywords. Oh—and did I mention keywords? 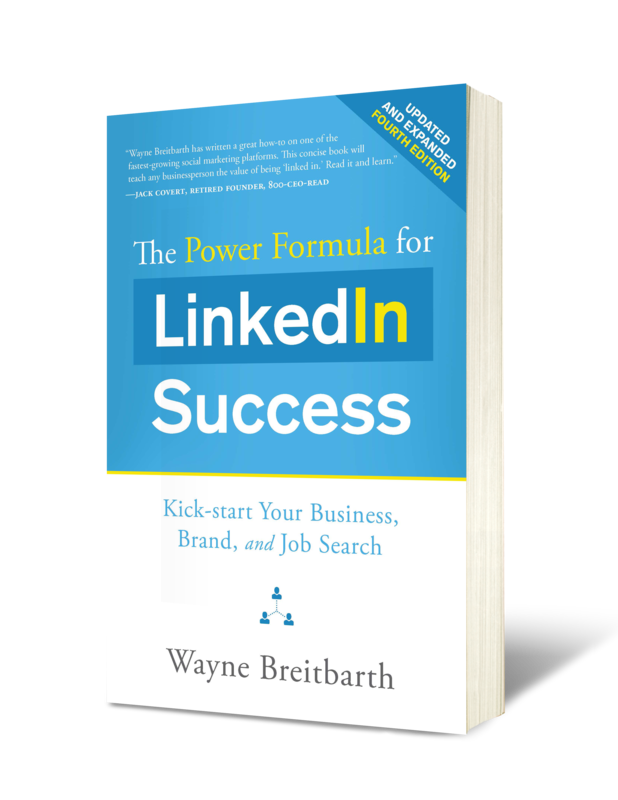 If you need help identifying your best keywords and understanding where to put them, download my free LinkedIn Keyword Worksheet. 8. Order is important. If you want to display multiple current jobs, like the work you are doing with your favorite nonprofit or industry association board in addition to your "day job" (I highly recommend doing this), then simply reorder the entries in your current Experience section. Do this by holding down the move icon (four horizontal lines) on the right of the actual experience entry and moving up or down to the order you prefer. 9. Grammar matters. Write this section in Word, check out the character count, run spelling and grammar checks, and then save and paste into your profile. 10. Would I hire me? Let some time pass; then review your entries and ask yourself: Will reading this inspire someone to want to hire me as an employee or as a vendor of choice? Is there a difference between the words experience and jobs? You bet there is, and I hope you now understand how to use the Experience section of your profile as a strategic weapon. If you would like my professional opinion on your Experience section, as well as the rest of your profile, then take advantage of my specially priced $197 LinkedIn consultation.